In the 13th April, 2018, a SCC Projects meeting was held, in which coordinators from all Lighthouse City Projects signed a manifesto pledging collaboration between all SCC01 H2020 Lighthouse City projects. Developing and validating key performance indicators and data collection procedures for European smart cities. GROWSMARTER is a European H2020 Smart Cities project to transform cities for a smart, sustainable Europe. It will demonstrate 12 smart city solutions to common urban challenges in Barcelona (Spain), Cologne (Germany) and Stockholm (Sweden). MYSMARTLIFE is a European H2020 Smart Cities project that is going to be implemented in Nantes (France), Helsinki (Finland) and Hamburg (Germany). REMOURBAN (REgeneration MOdel for accelerating the smart URBAN transformation) is a European H2020 Smart Cities project for implementing actions at energy, transport and ICT sectors in Nottingham (UK), Tepebasi (Turkey) and Valladolid (Spain). RUGGEDISED is a new lighthouse smart city project receiving funding from the European Union’s Horizon 2020 programme that brings together 3 lighthouse cities, Rotterdam (Netherlands), Glasgow (UK) and Umeå (Sweden). SHARING CITIES is a European H2020 Smart Cities project that aims to implement replicable urban digital solutions and collaborative models in Lisbon (Portugal), London (UK) and Milan (Italy). SMART CITIES STAKEHOLDER PLATFORM is the Market Place of the European Innovation Partnership on Smart Cities and Communities. SMARTENCITY, a project funded under the European Union’s Horizon 2020 programme planned and implemented in Vitoria-Gasteiz (Spain), Tartu (Estonia) and Sonderborg (Denmark). SMARTER TOGETHER is the European project in which lighthouse cities Vienna (Austria), Munich (Germany) and Lyon (France) and follower cities Santiago de Compostela (Spain), Sofia (Bulgary) and Venice (Italy), come together to improve citizens’ quality of life. STEEP (Systems Thinking for Efficient Energy Planning); was an innovative European project in a partnership between the three cities of San Sebastian (Spain), Bristol (UK) and Florence (Italy). Its aim was to develop Energy Master Plans for districts in each of these three cities. TRIANGULUM is a European H2020 Smart Cities project for demonstrating smart city solutions integrating energy, mobility and information & communication technologies in the city districts of Manchester (UK), Stavanger and Eindhoven (Norway) (Netherlands). MATCHUP is a EU-funded Smart City project involving three lighthouse cities and four follower cities from eight countries. MAtchUP cities will join forces to reshape their social, economical and environmental models and to promote social inclusion, liveability and prosperity for their citizens. IRIS is a HORIZON 2020 EU funded project beginning October 2017 for a duration of five years. 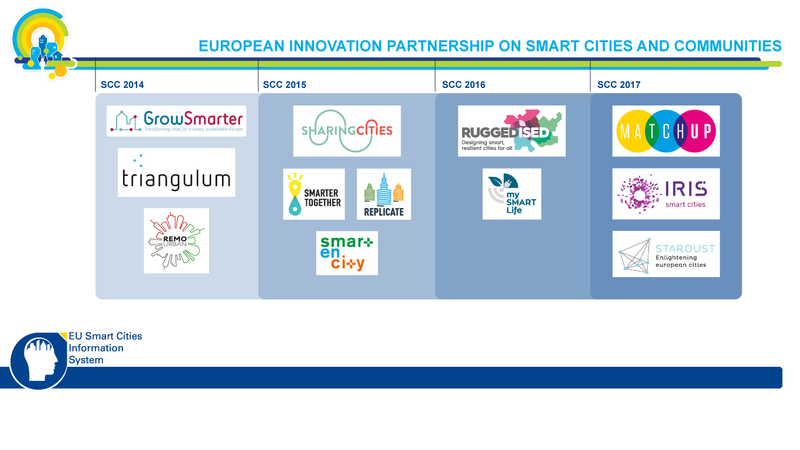 SMARTER TOGETHER is an EU Horizon 2020 Smart Cities project, which brings together advanced European cities, thus forming into a constellation of “innovation islands” – exemplary models of smart, highly efficient, intelligent and citizen-oriented cities.